A Veterans Day Celebration will be held Monday, Nov. 12, at 6 p.m., at the Black Tavern on Center Road in Dudley. 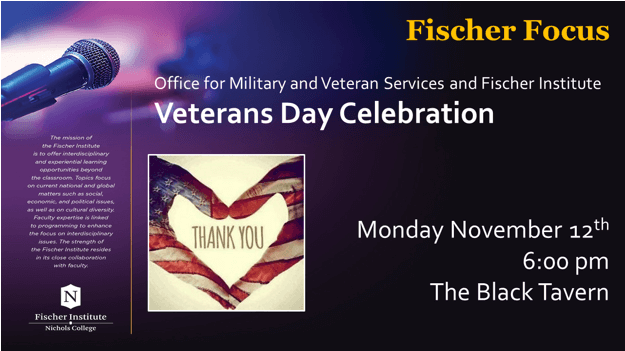 This free event is sponsored by the Nichols College Office for Military and Veteran Services and the Fischer Institute. Food and beverages will be provided. All are welcome to attend this informal social gathering; no RSVP is necessary. Campus Life, Events, Fischer Institute, Slider, Staff, Students military, veterans. permalink.